If I have any complaints about eating a real food diet, it’s that it can sometimes be really expensive. Whole Foods didn’t get the nickname “Whole Paycheck” by accident. Yes, it’s a crime that an organic tomato costs more than a hamburger at your typical fast food joint. And: there are very specific strategies you can employ to make eating real food affordable. 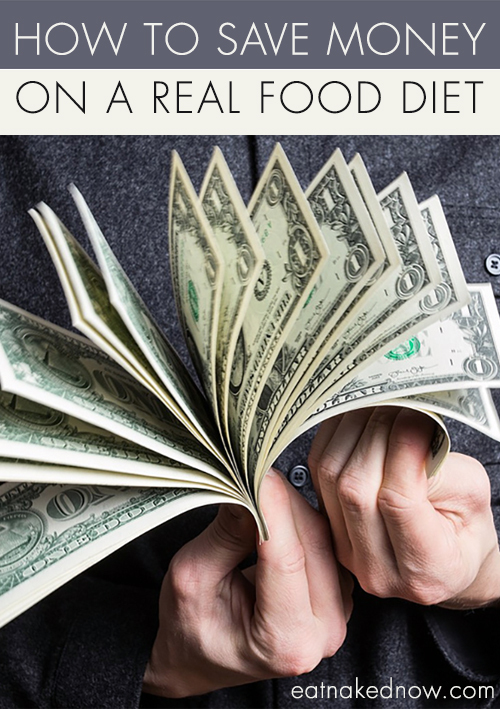 Here are six strategies to massively reduce the cost of a real food diet. Someone asked me recently what’s the difference between a processed food and a “whole food”? My reply was simple: a processed food HAS ingredients; a whole food IS an ingredient. While whole foods – especially if you’re looking for local and organic – can be a little spendier than their conventional counterparts, what makes Whole Paycheck so darned expensive isn’t just the organic tomatoes. It’s the cleaner, organic versions of pre-made foods that run up the tab. Organic, gluten-free paleo crackers? Yup, that’s going to run you a pretty penny. But the seeds that make them, if bought on their own – and even better, in bulk – are a fraction of the cost. There are tons of examples of overpriced pre-made foods, but I’m going to pick three of the real foodie favorites: bone broth, kombucha, and cultured veggies. Take bone broth for example. The most nutrient dense store-bought bone broth costs anywhere from $14 to $24 per quart. We’ll make six quarts in a batch, and the cost of the bones, when bought from our local farmer in 50lb boxes is approximately $1.75 per pound. We use 4lbs per batch, which comes out to $1.16 per quart. A huge savings! An even more cost-effective alternative to buying your own bones, is to save the bones from your roast chickens, rack of lamb, any meat you cook with the bone in (which, incidentally, is both typically more nutrient-rich AND less expensive! ), stick them in a freezer bag until you have enough for your next batch of broth, and use them for your broth. No additional expense and a delicious, nutrient-dense bonus to come out of your dinner. I wrote extensively about the cost savings of making your own Kombucha here. And homemade cultured veggies, which cost $7 and up for a 16oz bag, cost the price of a head of cabbage yielding at least twice that much sauerkraut. “But what about the time?” You say. Fair point. These things don’t make themselves. And the primary reason these three things are such top-ticket items is because when they’re properly made, they each take a lot of time to prepare (albeit most of that time is unattended). The extended prep time increases the cost of having someone else making it for you significantly. So you’re a busy person, I get that. But in my experience, it’s all about establishing a system. For bone broth, since we let ours cook for upwards of 72 hrs, we invested in a single electric burner. This allows us to make a big batch of broth without taking up a burner on the stove. In winter when bone broth is on high demand, we make this almost weekly. In the summer, maybe once a month. For the Kombucha, we use the continuous brew system which reduces workload immensely – once you’ve got it started, if you have the time to boil a kettle and fill a few bottles, you’re all set. One of the most expensive ways to buy your food is to shop somewhere like Whole Foods or similar high end organic grocers. You’re not just paying for the food – you’re paying for the beautiful displays, the convenient location, the friendly staff, and all the extras like cooking classes and wine tastings. If you’ve got the budget, then go for it. But if you’re trying to save some cash, there are far less expensive ways to procure healthy food that’s often far yummier. One of my favorites is to join a CSA (Community Supported Agriculture). We’ve been doing that since moving to Portland, and not only has it saved us a ton of money, it has allowed us to explore types of produce we’d never have picked up otherwise. Garlic scrapes? Heirloom varieties of turnips? Mizuna greens? We’d never heard of them before, and now we eagerly look forward to when they appear in our box. When we think of CSAs, we usually think of produce, but there are meat CSAs as well. Check out your farmers market or FarmMatch to find your local farmers and see who’s got a CSA. Usually it will bring the cost per pound down significantly. Another way to procure clean, pastured meat cost-effectively is to get a deep freezer and buy in bulk. Many farmers will sell you a quarter cow, or half a lamb or pig, all butchered and frozen. Stock up your deep freeze and you’ll be set for months at a significantly reduced price. We’ve now joined a chicken CSA, a salmon CSA, and another meat CSA that has a whole variety of types of meats and cuts to choose from. For the really ambitious, a garden can be a lovely way to cut expenses. Even if it’s just one or two of your favorite things, or the speedier items like herbs. We’re doing some construction in our back yard, so this year we don’t have a garden bed. I wanted to grow something, so I got a big plastic pot (cost: $12) a 16qt bag of organic potting soil ($14) and an heirloom tomato start at the farmers market ($4) of a particularly productive variety. That’s $28 all in. I can reuse the pot and will only need to add to the soil next year, so that’s a longer term investment, and overall this will save us money, yield the most delicious tomatoes, and if we do some canning of tomato sauces and salsas, save us even more money later in the year on something we might have bought in packaged form. If you don’t have the time for a full garden, consider a kitchen garden for herbs, which are really expensive when you buy them at the store. Even a little window box can give you a lovely yield and fresh flavors for your dinner. When I say the word “forage” images of being on my hands and knees deep in the forest looking for mushrooms comes to mind (not that I’ve ever actually done that), but it doesn’t have to be that extravagant. Here in the Pacific Northwest, we have a bit of a blackberry problem. They take over and grow everywhere. In your backyard, it’s truly annoying. But if you’re out and about and you find a good patch, bring a bucket and there’s some free food! You’ll find them along biking and walking paths, and on the edges of parks next to roadways. That’s just one example of what’s available here in our area. If you do a little research, you’ll find what’s available near you. Take advantage of your local bounty! Cost-efficiency in the kitchen isn’t just about where you procure your food, but what you do with it. Most of us waste an enormous amount. How much of your produce drawer actually gets eaten and how much ends up in your compost pile or garbage each week? A few things will help you be more strategic with your food so that you get the most out of it. Plan – a good meal plan goes a long way. If you get a CSA and aren’t sure what’s coming each week, set aside a bit of time once the box has arrived to map out your meals for the week. It will save you time during the week, it will alleviate the mental stress on busy weekdays of figuring out what’s for dinner, and it will help you make much better use of what’s in that box. Here’s the meal planning strategy I use. A corollary to this is to eat your fridge clean. It’s those last few straggler stalks of celery, the lemons that are stuffed at the back of the bin, the parsley that’s starting to wilt… If you force yourself to use these ingredients you’re going to get much more creative in the kitchen AND you’re going to actually eat the food you’ve bought, not toss it and end up spending more. Those are exactly the three things left in our fridge as I write this, and it sounds like the perfect stuffing for roast chicken, don’t you think? Get creative. If there are bits of food you’d usually throw away – like the broccoli stems for instance – see if you can find a way to use them. We like to use a peeler on broccoli stems and turn them into veggie pasta. A client of mine uses the almond pulp leftover from making almond milk for a paleo vegan faux hummus. There are lots of creative things you can do! When it comes to eating meat, eat “nose to tail”. In our culture, we favor the familiar cuts of muscle meat, but there are so many other parts of the animal that go to waste – many of them less expensive and more nutrient-dense. I already shared the tip about the bones. What about the organ meats and “odd bits”? I know this takes a big mental leap to get through, so here’s a great resource to get you started and inspired. 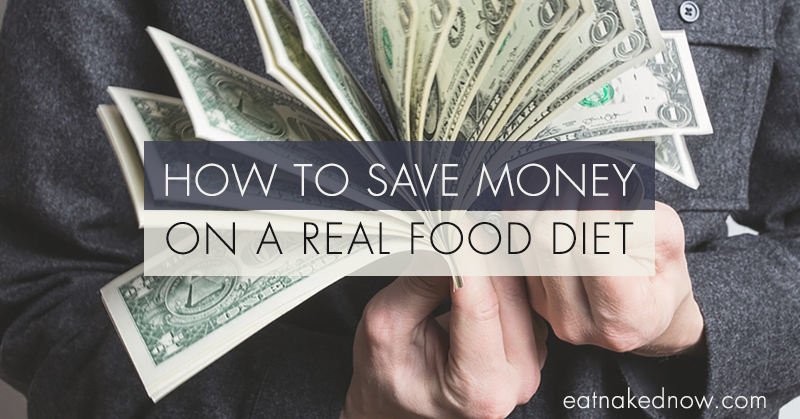 How do you save money while eating real food? I’d love to hear your tips and strategies in the comments below. 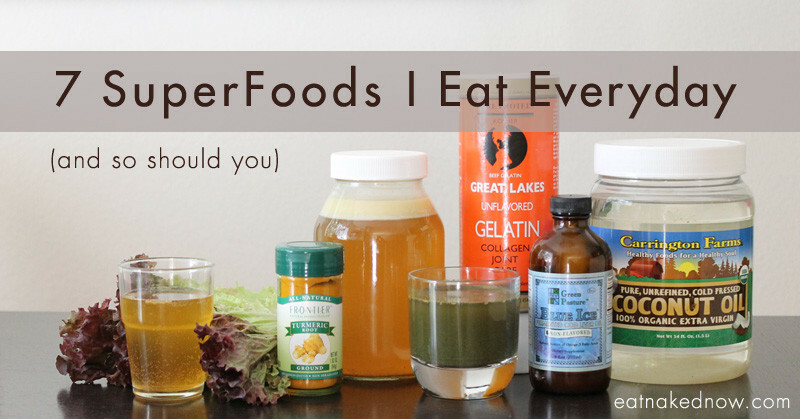 7 real superfoods I eat everyday. And so should you. Great article!! Thank you, Margaret! I can totally relate and have been in that exact same situation where it was actually the woman at the check out who after ringing up my 6 items and the total being over $60 asked me, “wow that added up fast, what did you buy? !” I will definitely look into some of your suggestions! I’ve been wondering what the heck to do with my almond milk pulp other than compost it. That’s great. thanks. Thanks for the tips! I keep a list on the front of the fridge of what needs to be used in the fridge and in the freezer and make a weekly meal plan too. Growing our garden is a great way to save money and I find it especially helpful for not wasting herbs as you can just go out and get what you need, rather than buying a bunch that in the past would often go bad in the fridge. A good yogurt tutorial is on epicurious.com. You can use a good quality plain yogurt as a starter. Make your own artisan bread…. But making your own artisan whole grain bread is a great place to start if you can’t part with bread. ‘Pinch of yum’has a great 3 ingredient ,no knead ,super easy artisan bread recipe. Flour, salt, yeast and water , mix in a bowl, let sit cover overnight, bake in a Dutch oven (deep cast iron pot with lid). Incidentally this bread has been well tolerated by many gluten sensitive friends and family due to lack of added gluten from commercial products and non gmo grains. Make your own granola, mix oats, raw honey, coconut or other high quality oil, and bake on a sheet pan. Add ins are unending here! Continuous brewer waiting for my live scoby to arrive! Those tips could cut the healthy food costs big time. Speaking about foraging, dandelion is my current fav. I just go out in the field and pick some young fresh leaves before each meal. Free organic leafy greens bursting with nutrients.